The best Australian Coach Tours they have been on. That's how people who have booked a tour with Mary and Brian, have reviewed them. The knowledge and stories of each area, you will appreciate learning so much real Australian History. as you lounge in the air-conditioned comfort of your luxury coach, while you enjoy the wonderful countryside of Australia. Ezi Drive Coaches & Mini Buses, the company with the people who make sure you have a good time in Australia. Mary and Brian will pick you up from your home in sydney, ready to start your holiday coach tour. Check out our new website just for Holiday Coach tours. Winetasting, Mudgee, the Hunter Valley or view the scenic Blue Mountains. 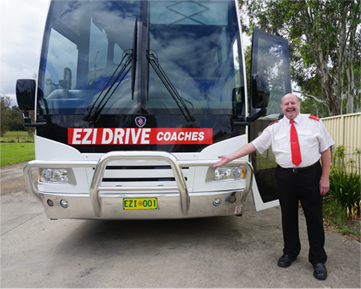 EZI Drive Coaches are fully maintained by licenced operators, and are owned and operated by Brian & Mary.